First, let me start by saying I love the Meraki networking stack. It is easy and efficient to deploy and customers love it. Occasionally, however, you find a key feature that Meraki won’t do. In this case, Any Connect client VPN. Any Connect is easy to deploy, it’s flexible and works on just about any client platform. In my design, I wanted to backhaul all Any Connect client traffic into the corporate network and then treat it with the same internet edge polies as corprate users. The Meraki MX series firewall is the source of policy enforcement so traffic will need to enter the network and then be routed through this device before going onto the wide open internet. The prior WAN routers where ISR G2’s so I decided to pull one of them off the shelf to stand in as the Any Connect termination point. An ISR is extremely flexible when it comes to routing tricks as well. First, here is the desired topology and traffic flows. As you can see the traffic is decrypted on the ISR and then takes another path to the internet through the Meraki MX. In theory this is simple, however, in practice the problem becomes the default routing on the ISR. More specifically the router gets its default route and that route directs traffic out the outside interface toward the internet. The problem is that the VPN traffic decrypted on that router needs to actually follow a different default route that will take it through the Meraki MX firewall prior to going to the internet. Because of this scenario, we will put the ISR’s internet facing interface in its own VRF, aka seperate routing instance, aka front door VRF, to terminate the tunnel but then dump the client addresses into the global routing table. If VRF’s are new to you it might be helpful to check out this post as well. Below I have added some IP information to better explain the design. The 1.1.1.2 IP address lives in the INET VRF. A common term for this is a “front door VRF” because it’s the direct interface, or front door, to the internet. All remaining IP addresses will be configured or dynamically allocated within the global routing instance. 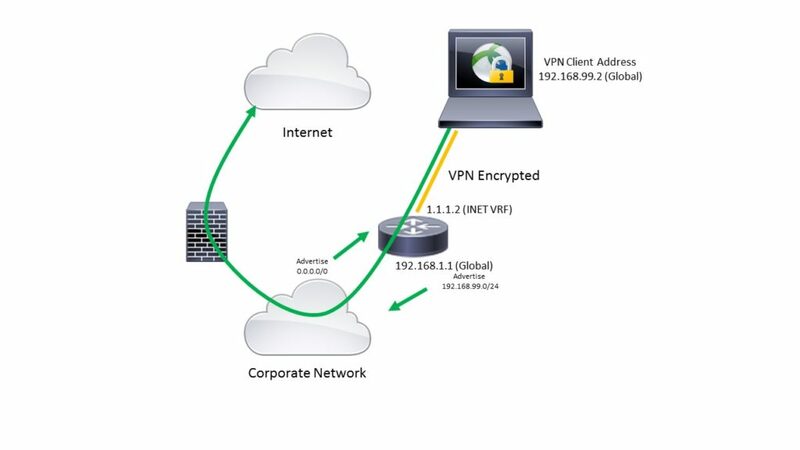 Depending on your topology it is also very likely your router will need to be advertising routes for the VPN clients into your corporate network to ensure full round trip connectivity. The global routing process will also pick up a default route from the corporate network that will guide traffic through the Meraki firewall. This default route would have confliceted with the routers default route to the interned had we not used the VRF features. Enough theory. Let’s see the configuration. Next, the supporting and direct configuration of the VPN headend. banner "WELCOME to the VPN"
The diagram refers to the fact that the remote access client subnet will need to be advertised to the rest of the network. The clients actually show up in global routing table as static /32 routes when they connect. This isn’t a problem as long as we remember to redistribute them into our routing protocol of choice and along to the rest of the network. In the case of my example I am grabbing them with a prefix list inside a route-map with the redistribute static command to dump it all into EIGRP. You will notice the prefixes are “le” options on this command. This indicates that only prefixes of /32 are matched. Finally, depending on the size of your client pool it may be advantageous to summarize the whole batch of clients into a single summary route for efficiency. To troubleshoot be sure to review both routing tables. Your VRF routing table should include a default and the internet segment and likely nothing else. The global routing table will include any other internal routes you would like your users to have access to. Since my environment is allowing everyone full access (this is a lab) you will see all of my routes listed on the VPN edge router. While each use case will probably be a bit different, I hope you found this information useful! Please feel free to leave your comments or questions below. This entry was posted in Networking, Security and tagged cisco, configuration, IOS, networking, security. Bookmark the permalink.